The suicide rate among women vets is 250 percent higher than non-vets. Sgt. Mosel wants to change that by raising awareness about the worsening crisis. 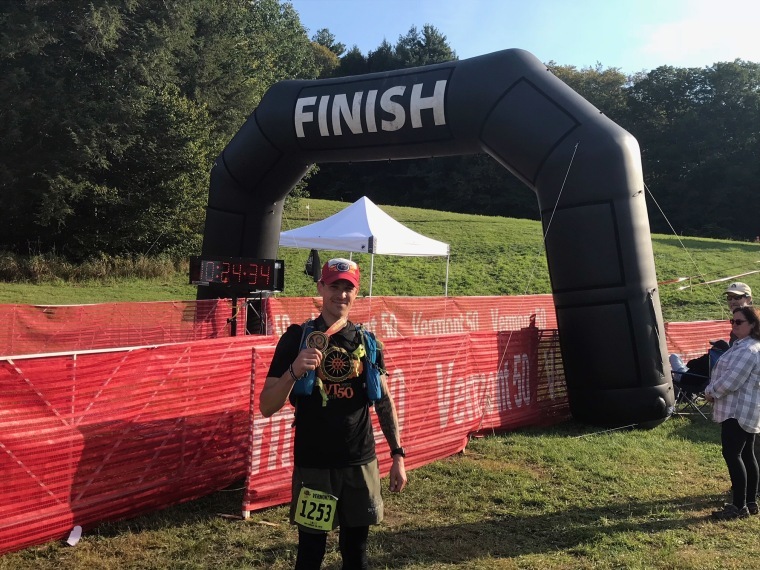 Jason Mosel at the Vermont 50, a 50 mile race in September of 2018.Courtesy of Jason Mosel. Jason Mosel is a super-fit former Marine, but even he hates doing burpees. And that’s exactly why he’s trying to do more than 4,556 of them in a row. Sgt. Mosel will attempt to break the Guinness World Record for the most chest-to-ground burpees in 12 hours on March 22. He will livestream the attempt, which will start at 6 p.m. and go late into the night for a specific reason: It's all planned to raise awareness about veteran suicide. Sgt. Mosel, 33, knows firsthand how difficult it can be to get through a night. He survived a suicide attempt in 2005 after struggling with mental health issues following his first two tours of duty with the Marines. The Corinth, Vermont, resident is one of the fortunate ones. About 20 veterans die by suicide in the U.S. daily, according to Veterans Affairs. And suicide rates are 22 percent higher among U.S. veterans compared to their civilian counterparts. Jason Mosel being pinned as a Sargent in Iraq in 2007.Courtsey of Jason Mosel. Sgt. Mosel said his fitness routine hugely benefited his mental health during difficult times. That’s why he chose burpees to help both veterans and civilians suffering from depression. Sgt. Mosel, a Connecticut native, signed up for military service when he was only 16, right after the Sept. 11 terror attacks in 2001. “That was our generation’s Pearl Harbor, and I knew I wanted to defend our country,” he said. After graduating high school in 2003, he headed to Parris Island, South Carolina, for boot camp and then to Camp Lejeune for infantry training. He deployed to Iraq in February 2004 for a seven-month duty, during which 34 Marines in Sgt. Mosel’s battalion were killed. Sgt. Mosel saw one particularly close friend die. Then came a second deployment, this time to Okinawa, Japan, in spring 2005. By this point Sgt. Mosel recognized he had serious depression and was suffering from effects like insomnia. He saw a mental health professional and was prescribed what he called “a cocktail of pills.” The medication made him feel numb, but not better, and one night in 2005 he attempted suicide. Fortunately he was found, taken to a hospital and brought to a mental health facility, which again prescribed him medication. Sgt. Mosel made it through his third and final tour of duty, again to Iraq from winter 2006 to spring 2007 and was honorably discharged from the Marines. He and his wife, Amber — who wed in 2004 — had been talking about what was next. Jason married wife Amber in October 2003.Courtesy of Jason Mosel. A glimmer of hope came in 2011 when Sgt. Mosel saw a TV commercial for Shaun T’s Insanity workout. Mosel completed the 60-day program and felt great, but afterward he fell back into heavy drinking. A few months later, Sgt. Mosel finally found a mental health professional he really clicked with at an outpatient facility through Veterans Affairs. He had sessions weekly, then biweekly and finally every month. Sgt. Mosel had started to feel better. But it was a contest in 2013 that he credits as another major turning point: A friend asked him to participate in a Tough Mudder obstacle course race at Mount Snow in Dover, Vermont. Tough Mudder inspired Sgt. Mosel to sign up for Spartan Death Races, 50-mile ultramarathons and other intense events. “Instead of coming home and picking up a bottle, I was putting shoes on and going for a 15- or 30-mile run,” Sgt. Mosel said. The idea for the burpee world record attempt came to Sgt. Mosel last November, when the Spartan Race organization issued burpee challenges to help work off increased caloric intake around the holidays. Sgt. Mosel looked up the Guinness World Record for burpees and resolved immediately to embark upon an awareness campaign. He wants everyone who watches the livestream, whether or not they’re veterans or suffering from depression, to come away with a sense of hope. Jason Mosel in his workout room after completing 1,500 burpees in February 2019.Courtesy of Jason Mosel. That’s true of anyone who is suicidal, but Sgt. Mosel wants people to know veterans are particularly at risk. After adjusting for differences in age, suicide is 19 percent higher among male veterans compared to civilian U.S. men. And the risk is even higher for women veterans — their rates of suicide are 250 percent higher than non-veteran women, in part because they are “often made to feel unwelcome by their own military units,” and at worst may have suffered sexual harassment or assault from their male counterparts, said Haring of the Service Women’s Action Network. Sgt. Mosel will attempt the World Record on March 22 at the Snap Fitness gym in Berlin, Vermont, where family, friends, a few spectators and those watching the livestream will cheer him on. He's been training for nearly three months on his property in Vermont, which includes 14 acres of land. He carries boulders up hills, runs 80-100 miles a week and of course gets in as many burpees as possible. “The challenge I set for myself is the time I wake up and is the amount of burpees I do: So if it’s 5 a.m., I do 500; 6 a.m., I do 600, etc.” Sgt. Mosel said. “Then on Friday nights, I do a long burpee session of at least 1,500.” His single-session record so far is 3,000 burpees. To prepare mentally for the World Record attempt, Sgt. Mosel is reading books like “Can't hurt me: Master your mind and defy the odds,” by David Goggins. He also connected with Vallorie Pallotta, the mother of a veteran who died by suicide, and is raising funds as part of the attempt for her veteran-centered nonprofit Josh Pallotta Fund.